It was bound to happen: The world without borders, Okou create chaos in our fixed ideas. They have created a music that is sophisticated, acoustic, spiritually inhabited, free and played as if it didn't belong to time. Okou is neither Folk, Pop, World, or Soul but a turmoil of all these. 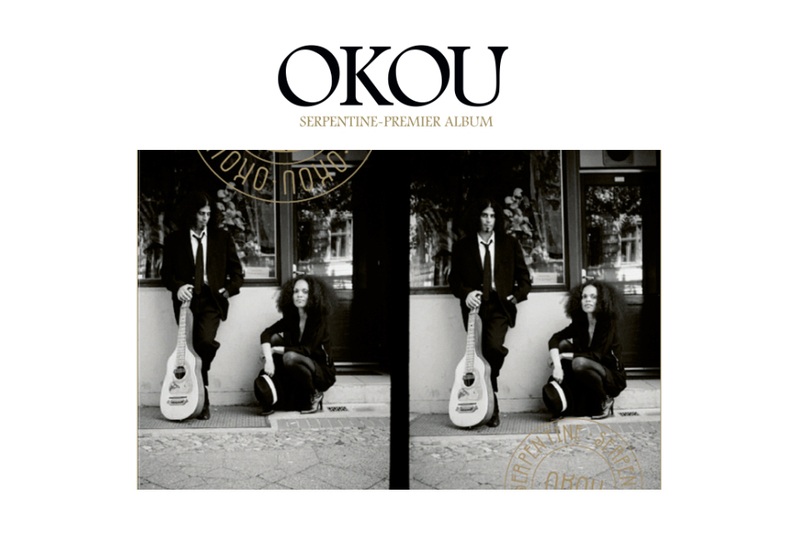 Okou is a new adventure: Tatiana Heintz & Gilbert Trefzger met only 3 years ago. From a French father and an Ivorian mother,she lived her young life in West Africa. In a bar she meets Gilbert Trefzger, a Swiss guitarist with Egyptian roots who studied the Oud, Slide Guitar and Banjo. «Immediately something happened musically between the two of us». She lives in Paris, he is between Basel and Berlin, they compose and record each on their side, «but to finalise a song we need to be together. This is why we have named our album 'Serpentine'». The album was recorded in 5 days in live conditions. The casting which was directed by Jean-Philippe Allard and Jay Newland, who produced the album, was exceptional: on double bass Ira Coleman, on percussion and drums Andrew Borger, on Tuba Dave Bargeron, on Accordeon and Piano Brian Mitchell, the string arrangements are signed Gil Goldstein who also played the Accordeon. «We didn't need to talk to understand each other, says Tatiana. Everything was based on energies more than on a concept.» Which makes Serpentine sound like an outstanding balancing act.